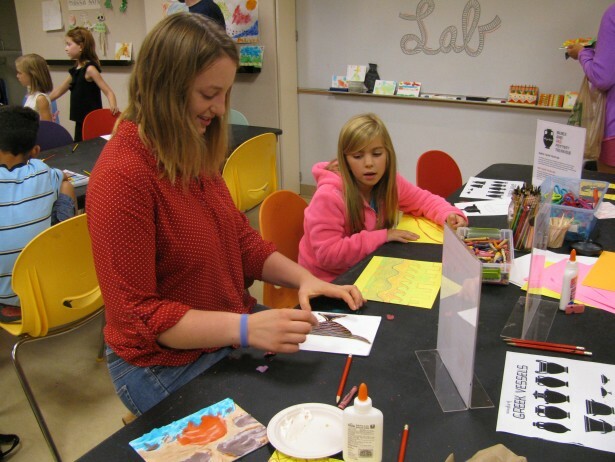 The Trout Gallery offers multi-age programs for home school students several times during the academic year and the summer. The programs are designed to interface the museum’s exhibitions with the core curriculum subjects of language arts, history, math, and science. Children engage in lively activities and close observation while exploring an exhibition and create a small project in the art classroom. Class size is limited to 28. The Trout Gallery offers award-winning programs that combine art and language to promote language acquisition and cultural appreciation. Please contact us to learn more about bilingual tours, ESL offerings, and language learning programs for your group. February 18, 2019 L'impressionnisme/Impressionism: France was the birth place of Impressionism--a style of art so full of color and life that Americans began to use it to paint Pennsylvania in the 19th century. In this program, students will examine Impressionist works from The Trout Gallery collection, learn French vocabulary for talking about art and style, and create their own impressionist paintings. March 15, 2019: Edo Japan and the Samurai: During the Edo period shoguns, emperors, and samurai created a new world that would impact Japanese civilization up to today. In this program, students will explore the world of Edo Japan through an exhibition at The Trout Gallery, create original prints using the methods of Edo artists, and practice speaking and writing about the Samurai in Japanese. *Scholarships are available for these programs. Due to a current staff vacancy, we are unable to offer K-8 homeschool programs for our Spring exhibitions. We expect to resume K-8 offerings beginning in June.